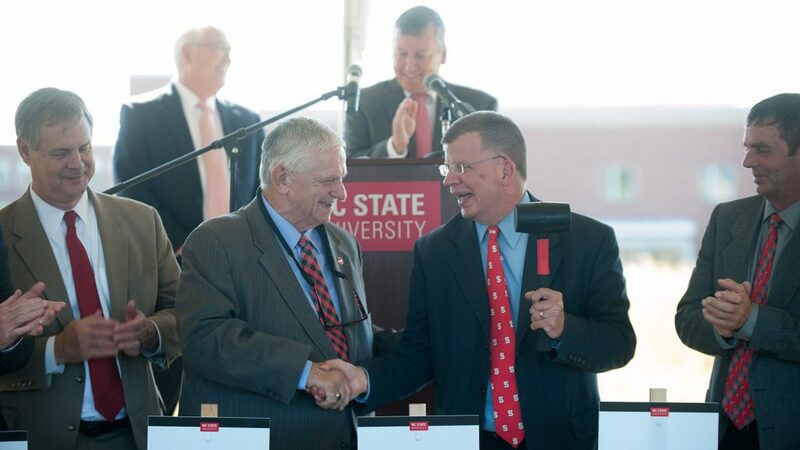 Commodity group officials and other agricultural leaders planted their stakes, literally, in the ground on NC State’s Centennial Campus Tuesday, Oct. 31, marking the commitments they and their organizations have made to the North Carolina Plant Sciences Initiative. Gathering at the site where NC State will soon build a hub for the initiative, College of Agriculture and Life Sciences administrators and NC State Chancellor Randy Woodson thanked the 44 groups that contributed both funds and insight that have helped launch the initiative. “This will be the premier plant sciences building in the entire world, and we will have it because of you,” said Dean Richard Linton. From left: (Front) Peter Daniel of the North Carolina Farm Bureau, Dan Weathington of the North Carolina Small Grain Growers Association, Dan Gerlach of the Golden LEAF Foundation, Paul Talley of the N.C. Agricultural Foundation, and (Rear) NC State University’s Randy Woodson and Richard Linton. Agricultural leaders who spoke at the stakeholder celebration were Larry Wooten, president of the North Carolina Farm Bureau; Dan Weathington, executive director of the North Carolina Small Grain Growers Association; Paul Talley, chairman of the North Carolina Agricultural Foundation; and Dan Gerlach, president of the Golden LEAF Foundation. CALS Dean Richard Linton noted that the college has raised most of the cost of the $160.2 million building, and with stakeholders’ strong support, the initiative continues to make fast progress. Architects are working with university representatives to design the state-of-the-art building. Construction is expected to begin in 2019, with doors opening in 2021. Wooten noted that while much progress has been made, much more work remains to be done to achieve the goals of making North Carolina the global leader in plant sciences. In the end, meeting that goal will benefit farmers, consumers and communities. As Dan Gerlach said, a key measure of the success of Golden LEAF’s $45 million investment in the initiative will be money in farmers’ hands. Find out more about the North Carolina Plant Sciences Initiative.